As always excellent service and top notch professional care. You see Dr Bufalino is simply the best there is anywhere. This was a routine check up. Everything I wanted to discuss was handled in a clear and Comprehensive manner by this provider. Dr. Bufalino always takes the time to listen and address any concerns about your health and is well versed on your medical history. Always caring, informative and efficient. I am always listened to and like the way things are explained to me. I drove from my home in Mequon Wisconsin to Naperville Illinois to see Dr. Bufalino because he is the best cardiologist. He is very attentive. You can tell he loves what he does. He looks me in the eye when he talks to me. He treats me with respect. He is a great Dr.! 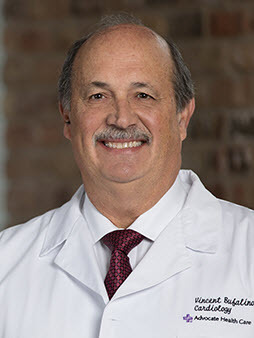 visits are always pleasant satisfactory and informative I have very much confidence in my doctor, and feel I am in very good hands I trust Dr Bufalino to help keep my heart healthy. As always it was very good. I was very pleased as usual with my provider. He is excellent in evaluating my cardiovascular condition based on my at home blood pressure readings versus the ones in his office. Dr. Bufalino and his staff are always helpful, courteous and knowledgeable. Dr. Bufalino and I have a doctor - patient relationship for over 34 years. I love every minute of it. Always excellent treatment and service by Dr Bufalino over decades now. He is considered to be part of our family who looks out for our well-being. as is usual, Dr. Bufalino was very helpful, answered all my questions to my satisfaction and advised me on other health topics we discussed. I felt that he focused on me totally during our appt. giving me all the time I needed. thank you for being my Cardiologist. Dr. B is an excellent doctor and I have full trust in him. I can ask him any health question and he is very patient and knowlegable and explains everything. He is my favorite doctor out of any other doctor I see. I am always treated with respect. Health issues are always discussed with me so that I understand what is good or not so good after paperwork is received from recent tests. This doctor is my favorite Doctor to see and I trust him fully. Will always recommend any friends or family to see him. Dr. Bufalino is a very busy man. My appointment was on time, covered everything we needed to without any glitches. I have been with Dr Buffalino for 21 years, I consider myself very lucky to have him as my Heart Doctor . Dr. BUFALINO is the best. I wouldn't trust my heart health to anyone else. Very happy with my continual care with him and his team. Very pleasant as usual, was seen 2 minutes after arrival. Dr Bufalino is the best!! Dr Bufalino is an excellent health care provider. Dr Bufalino is rated 10. He listens and is very attentive. Answered all questions. excellent appt. dr. bufalino is my favorite dr. It is always a pleasure to see Dr. Bufalino, especially when visits REMAIN routine. As always - am so very grateful to be under his care. As is all our family! Dr. Bufalino is a superior professional and a good friend of my family. Dr. Bufalino is consistently punctual, kind, caring and clear about my condition and treatment. I feel really lucky to have him as my doctor. Good doctor who is frank and honest. Listens and gives honest opinions with accurate diagnosis. Cares. Dr. Bufalino is a kind and caring physician who has seen our family through several serious medical issues. He is a one of a kind person who actually takes time to listen to our concerns. We GREATLY appreciate having him as our cardiologist. Dr. Bufalino is a caring and compassionate provider. He always takes the time to explain and is definitely concerned with my personal health and well being. He has an excellent staff. I wish more were like him. Have a very good relationship with Doctor and staff. I am pleased to be able to see Dr. Bufalino at the Sandwich, IL office. I would have had to get someone to drive me out to Naperville. It is great that I can drive myself without bothering anyone else. I really appreciate it. I liked Dr. Bufalino one second after meeting him! Dr. Bufalino is priceless. The staff that he brings with him and the staff at Sandwich Clinic are simply awesome! He`s polite,kind, and knowledgeable. Would`nt trade him for any other. I`m quite confident having Dr. Vincent Bufalino. Dr. Bufalino and his staff are always great. X is always very helpful to me. Dr. Vince is a very warm comforting doctor. He makes you feel like part of the family and wants you to be comfortable he has a gifted away about his presentation. The doctor is a very caring & understanding provider of my specific health needs. Office was very accommodating. Got caught in traffic and they rescheduled me for 45 minutes later. Dr Bufalino asks me questions, and listens to my responses. Most other doctors don't. I know the provider for over 20's some years. He is very to easy to talk to. He listens and answers all my questions at all times. The provider is my DOCTOR & FRIEND. I would never hesitate to recommend Dr. Vince Bufalino to any member of my family. I was pleased to have been able to see Dr. Bufalino without an appointment for an urgent basis at Edward Healthcare in Sandwich. It was a good discussion at my level of understanding. My needs were met. Medications reviewed. Dr. Bufalino is a good listener and easy person to talk to. Always satisfied. No problems ever. Vince, always looks out for my best interest. Honestly, the visit was so quick. It gets quicker each time I see Dr. Bufalino. I left there wondering if I should even return. He seems to dismiss my concerns and rushes me out the door. This last visit he took a phone call on his cell phone while I was asking a question and left the room and never returned. I didn't know when I should return or what to do so I had to ask the nurse if I was done. I could not believe he just walked out like that. It makes me think that he does not take my questions or concerns seriously, and maybe he is not the doctor for me. I understand he is very busy, but then lighten the patient load instead of rushing me out the door mid visit. I just feel like I wasted time and money going there. I could have just read my results myself and called a nurse if I had questions I guess. I ALWAYS LOOK FORWARD TO MY VISIT WITH DR. BUFALINO, HE IS A WONDERFUL DR. Very professional; my concerns were addressed appropriately. always a pleasure seeing Dr Bufalino. very supportive of my knee surgery and provide great heart health information. Dr. Bufalino is one of the best. I am fortunate to have him as my cardiologist. All medical & office people are very good. Good care. Trusted cardiologist for past 19 years. Dr. Bufalino is very down to earth, approachable and explains things in an easy to understand, common sense way. I always feel confident in my cardiac are/health after seeing him. Doctor Bufallino is the very best doctor I have ever had. health eNews with Vincent J. Bufalino, M.D.